12/29-12/30, 6 girls & 5 boys! Lacey is our 3 year old, one half Slovakian English Cream Golden Retriever. She is the daughter of Lilly and Kilo. She has a beautiful blocky head and is a moderate size gal weighing in at 72 lbs Her thick coat is a soft, creamy white and her round, dark chocolate eyes will melt any heart. She has a gentle and sweet temperament and is training to be a companion dog. She loves children and other dogs. Her hobbies include playing "find it", dancing, swimming in the pool and going for walks. She has a great sniffer and is obsessed with tennis balls. She is the most cuddly and huggable golden we have ever owned. Monty is a wonderful 5 year old AKC Golden Retriever boy with a gentle soul. He is very willing please and a pleasure to live with. Monty has adorable facial features like his "submissive smile". He loves to snuggle with his family in their recliner. He weighs 67lbs and has a sweet disposition. 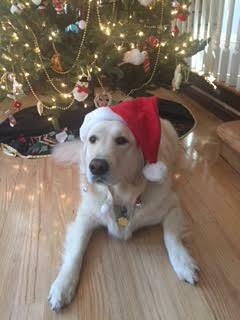 He is owned by Dees Golden Retrievers in Westerly, RI.